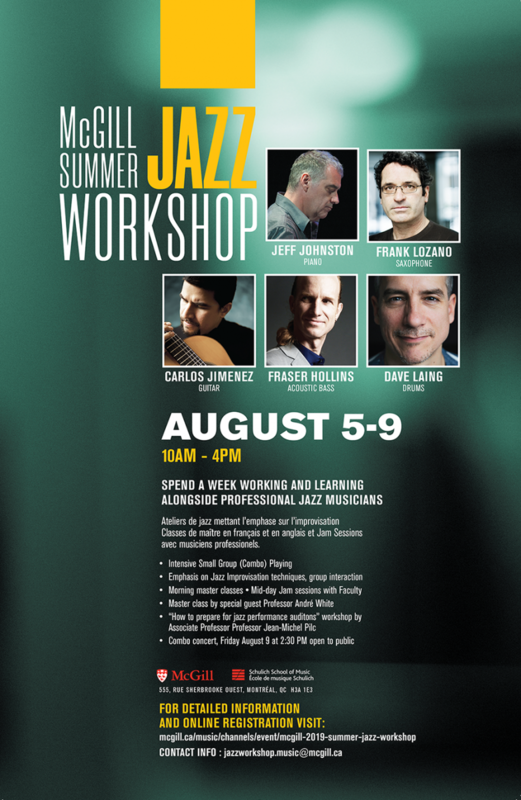 By signing up for the week- long jazz workshop, students can learn about and develop skills, playing experience and insight into the materials and methods essential to a program such as Schulich's. The focus will be on the small group jazz combo (four to six players per combo), the most direct vehicle for learning about improvisation, repertoire and most importantly, interaction among the participants. A ratio of one teacher to six students provides a stimulating and focused environment where students get personal one-on-one training from professional musicians. Morning master classes present essential basics about jazz materials, improvisation, jazz history, etc which serve to complement the combo sessions they have throughout the day. As well, Associate Professor Jean-Michel Pilc will present a Performance Audition Requirements master class, where he will explain and de-mystify the audition process , providing helpful and detailed advice to prospective undergraduate applicants. New this year, Prof. André White will be our special guest clinician; students will benefit from his extensive experience as a virtuoso improvisor and teacher. If your application is accepted, you must pay the full camp fee ($425) by June 3, 2019. If you cancel after July 15, 2019 you will receive a 50% refund. If you have been accepted, your spot will only be confirmed once you have made a payment. If we have not received payment by June 3, 2019, your spot will not be secured and may be offered to those on the waitlist. To broaden and expand the students’ knowledge and playing experience via the small group jazz combo (4 to 6 players per combo), the most direct vehicle for learning about improvisation, repertoire and – most importantly – interaction among the participants. As well, Associate Professor Jean-Michel Pilc will present a Performance Audition Requirements master class, where he will explain and de-mystify the audition process, providing helpful and detailed advice to prospective undergraduate applicants. On the last day, Friday August 9, a small informal concert will be held at the Schulich School of Music (in the lobby of the Elizabeth Wirth Music Building) where the students can share the music they have been working on with their families and friends. Are accommodations available on campus? The workshop has a tuition fee of $425, which is paid in one installment by cheque. Please write the name of the participant on the cheque. All applicants will receive an email telling them whether they have been accepted or not. If you have been accepted, your spot will only be confirmed once you have made the full payment by cheque.